Create lasting harmony and keep love alive with psychotherapist and bestselling author Jonathan Robinson's powerful and simple methods for effective couples’ communication. For anyone who wants to enhance their relationship by learning to communicate with less blame and more understanding Communication Miracles for Couples will show you how. Jonathan Robinson is a psychotherapist and a professional speaker, who conducts workshops on communication, leadership, and team building at Fortune 500 companies. 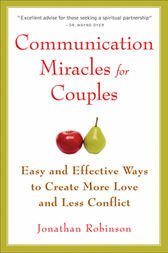 He is the author of Communication Miracles for Couples. Visit him at www.findinghappiness.com.